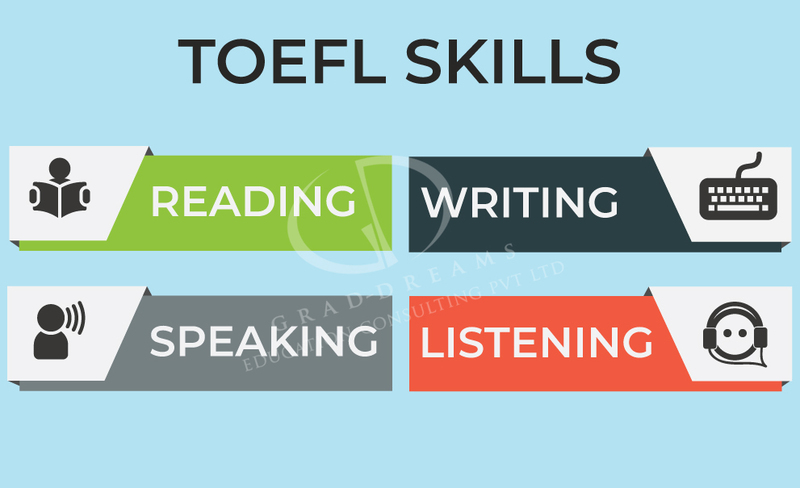 The TOEFL (Test of English as a Foreign Language) is a test taken by non-native English speakers who wish to pursue their study in natively English speaking countries like USA and Canada. Grad-Dreams provides expert TOEFL training to students to improve their performance on the TOEFL test. Grad-Dreams also helps students to register for the TOEFL test. An ideal TOEFL score is anything above 100. The TOEFL training batch is initiated twice on 1st and 15th of every month. Total hours spent on classroom training: 36 hours. Learn to manage time: It is always necessary to manage time. All the skills are timed and it is necessary to maintain the time so as to be efficient in managing and correcting the answers. Knowing the test instructions: Know the format of the exam as well as the test instructions before attempting the exam. This helps students to go through the exam smoothly. Build Vocabulary: TOEFL is all about building vocabulary and enhancing the scores. To get a high score, one must develop on high level words, synonyms and phrases. Students must make use of high frequency words, especially in Writing and Speaking and make use of it daily. Note: Taking: Note taking is an essential skill of TOEFL. It is necessary in Listening as well as Speaking skills. This also helps in Integrated skills of the TOEFL iBT test. One must take note of details as much as possible which is helpful while answering the questions. Stress & Time Management: Often students are worried about time running and they become conscious as they will loose time. While answers have to be correct, it is equally important to manage time without taking stress.